Tinnunculite: Mineral information, data and localities. 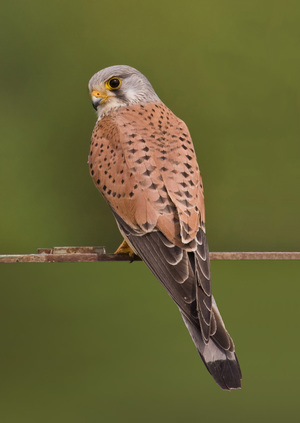 Named after the Common Kestrel (Falco tinnunculus). An original description was of material formed as a product of hot gases from a burning coal dump reacting with excrement from Falco tinnunculus. It was rejected by the IMA for being of anthropogenic origin (the burning coal dump), however natural material was later found and the name was kept. Not to be confused with Tinnunculite (of Chesnokov & Shcherbakova). 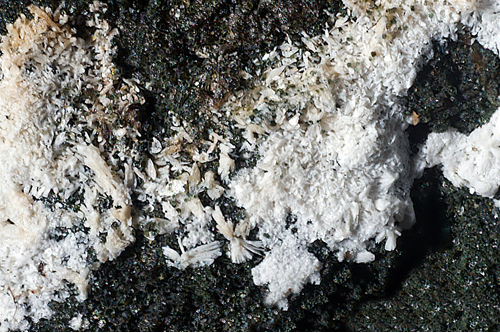 A naturally occurring dihydrate of uricite (uric acid) to which it is visually very similar. Well-known rare component of urinary and other stones. 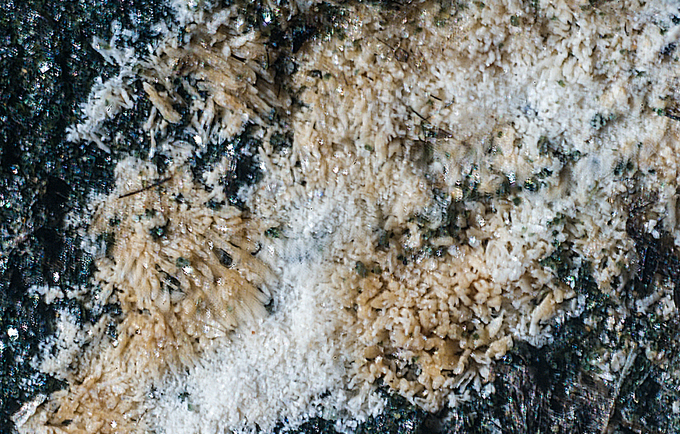 Chemically (C-H-N-O) similar to other organic minerals: guanine, uricite; also acetamide, kladnoite. Pekov, I.V., Chukanov, N.V., Yapaskurt, V.O., Belakovskiy, D.I., Lykova, I.S., Zubkova, N.V., Shcherbakova, E.P., Britvin, S.N., Chervonnyi, A.D. (2016) Tinnunculite, C5H4N4O3·2H2O: finds at Kola Peninsula, redefinition and validation as a mineral species. Zapiski Rossiiskogo Mineralogicheskogo Obshchetstva: 145(4): 20-35. Ringertz, H. (1965) Optical and crystallographic data of uric acid and its dihydrate. Acta Crystallographica: 19: 286-287. Lonsdale, K. and Mason, P. (1966) Uric acid, uric acid dihydrate, and urates in urinary calculi, ancient and modern. Science: 152: 1511-1512. Shirley, R. (1966) Uric acid dihydrate: Crystallography and identification. Science: 152: 1512-1513. Lonsdale, K. and Sutor, D. J. (1971) Uric acid dihydrate in bird urine. Science: 172: 958-959. Hesse, A.; Schneider, H. J.; Berg, W.; Hienzsch, E. (1975) Uric acid dihydrate as urinary calculus component. Investigative Urology: 12: 405-409. Yong Go, K.; Boerner, R. H.; Berg, W.; Schneider, H. J. (1980) Stabilization factors for uric acid dihydrate - a contribution to urine stone formation. Jenaer Harnsteinsymposium: 6: 71-74 (in German). Dosch, W. (1981) New urates (II): uric acid and uric acid dihydrate. Fortschritte der Urologie und Nephrologie: 17: 254-264 (in German). Boistelle, R. and Rinaudo, C. (1981) Phase transition and epitaxies between hydrated orthorhombic and anhydrous monoclinic uric acid crystals. Journal of Crystal Growth: 53: 1-9. Babic-Ivancic, V., Furedi-Milhofer, H., Brown, W. E. & Gregory, T. M. (1987) Precipitation diagrams and solubility of uric acid dihydrate. Journal of Crystal Growth: 83: 581-587. Chesnokov, B.V., Shcherbakova T.P. (1991) The mineralogy of burnt dumps of the Chelyabinsk coal basin. Moscow, p. 152 (in Russian). Artioli, G., Galli, E. & Ferrari, M. (1993) Uric acid dihydrate - a new mineral? 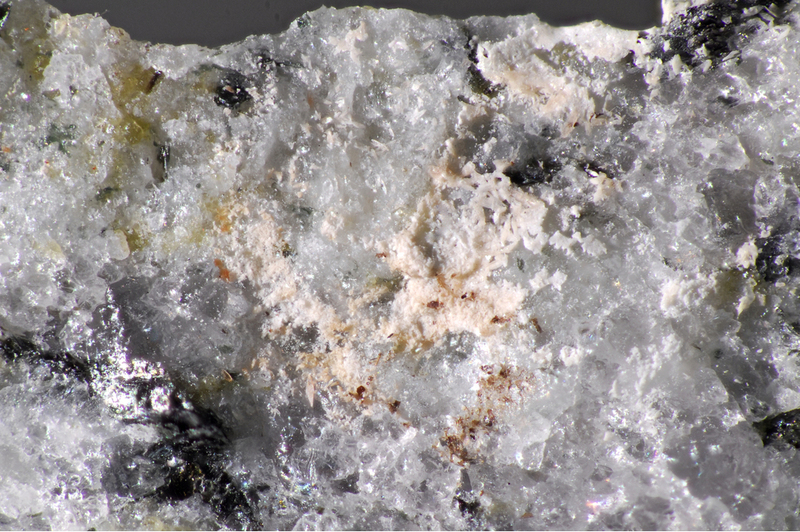 Rivista Mineralogica Italiana: 4: 261-264 (in Italian). Artioli, G., Masciocchi, N. and Galli, E. (1997) The elusive crystal structure of uric acid dihydrate: implication for epitaxial growth during biomineralization. Acta Crystallographica: B53: 498-503. Chesnokov, B., Kotrly, M. and Nisanbajev, T. (1998) Brennende Abraumhalden und Aufschlüsse im Tscheljabinsker Kohlenbecken - eine reiche Mineralienküche. Mineralien-Welt: 9(3): 54-63 (in German). Parkin, S. and Hope, H. (1998) Uric acid dihydrate revisited. Acta Crystallographica: B54: 339-344. Zellelow, A. Z., Kim, K.-H., Sours, R. E. & Swift, J. A. (2010) Solid-state dehydration of uric acid dihydrate. Crystal Growth and Design: 10: 418-425. Pekov, I.V., Chukanov, N.V., Belakovskiy, D.I., Lykova, I.S., Yapaskurt, V.O., Zubkova, N.V., Shcherbakova, E.P. Britvin, S.N. (2016) Tinnunculite, IMA 2015- 021a. CNMNC Newsletter No. 29, February 2016, page 202. Mineralogical Magazine: 80: 199–205. Belakovskiy, D.I., Cámara, F., Gagne, O.C., Uvarova, Y. (2017) New mineral names. American Mineralogist: 102: 1961-1968. Cuchet, S., Crumbach, M. & van der Burgt, A. (2016) Le allaniti e i minerali di terre rare dell'Alpe Veglia (Varzo, Verbano-Cusio-Ossola). Rivista Mineralogica Italiana, 40, 212-241. Pekov, I.V., Chukanov, N.V., Belakovskiy, D.I., Lykova, I.S., Yapaskurt, V.O., Zubkova, N.V., Shcherbakova, E.P. and Britvin, S.N. (2016) Tinnunculite, IMA 2015- 021a. CNMNC Newsletter No. 29, February 2016, page 202; Mineralogical Magazine, 80, 199–205.